All roads lead to Jam Bay, Khanom. Thailand is full of places which capture the imagination. The postcard castes of the Andaman Sea, the roaring waterfalls of the Southern mountains or the palm tree lined beaches all inspire many travelers to leave their homes in search of adventure. There are however parts of Thailand which remain largely untrodden. You might think you’d have to sacrifice beauty for peace or hike deep into the Thai jungles. Which, granted, would probably gain you solitude and wonder, but certainly there’s an easier way. Khanom is a beach side town that remains largely undeveloped and is the ideal area for camera snaps and undisturbed exploration. The long, curved beaches welcome a calm ocean and the green hills add the perfect backdrop to the scene. Explore those hills and you find quiet waterfalls and deep caves with beautiful formations. This road leads down to our favourite spot in Khanom, a sleepy beach bar and bungalow establishment named Jam Bay. View from one of the wooden salas which make up Jam Bay, Khanom. After a weekend at Jam Bay, a friend of mine remarked “I felt like I was a guest at someone’s home.” The welcoming nature of the owner, Joe, puts you at ease from the moment you arrive. Put your bags down and kick back by the bar, which is shaped around the wreckage of an old boat. The murals around the bar, bare testimony to the love of Jam Bay shared by locals and foreigners alike. Wooden salas stand against the ocean views, one crafted to house an outdoor library, another shelters a pool table while two have perfectly situated hammocks draped from their sturdy poles. 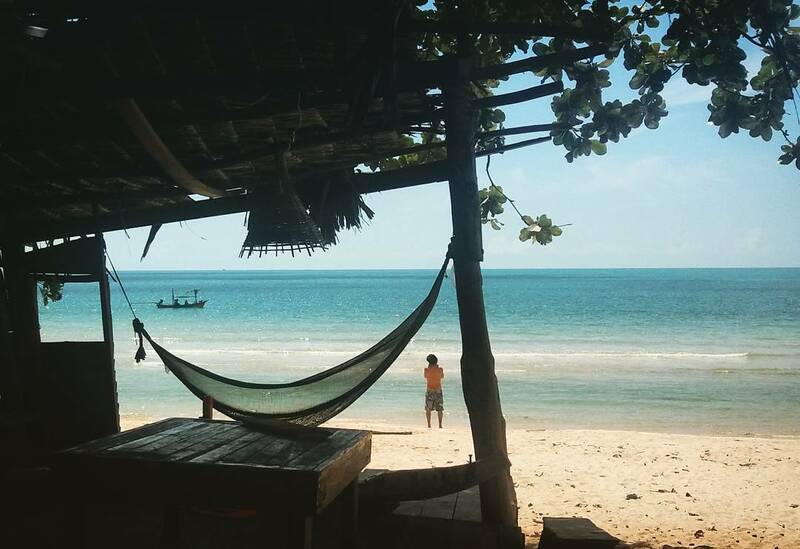 Time works it’s way slowly around the little beach bar, and returning from a Khanom excursion you’re bound to once again find yourself watching the day pass by in the well-worn hammocks. The trees around Jam Bay dominate the landscape. Jam Bay is built with its environment. From the ocean, its wooden structures blend with the beach trees and bushes. At night you might more easily spot a campfire flickering across the bay, or hear the local band drifting across the water. But it’s not only it’s physical presence which melts into Khanom. The owner, Joe, works with the local community to ensure that all his business spreads through the town. In the morning a coconut ice cream seller will ring her bells along the Jam Bay paths, while motor bike taxi owners ferry new guests to and from town. Joe sets up art events, and charity drives for the orphans and local schools. Constantly and enthusiastically Jam Bay gives double for everything it takes.This is a place where you can feel, as a traveler, that you’re a part of something bigger. Our home for the night on Haad Nadan in Khanom, Thailand. My time in Thailand is studded with places full of memories, but no place has captured so many as right here. Star gazing with friends and a bottle of Hong Tong, long lazy mornings passing the time from a hammock and watching storms roll in off the ocean. All of it interwoven with conversation, both pointed and otherwise. The long empty beaches and calmly breaking ocean are the perfect combination for a weekend of recharging the brain and re-energising the body. Fisherman cast their nets off Haad Nadan before sunrise. In an attempt to beat the crowds we often make the trip up to Khanom on Friday night after school. Saturday mornings, bleary eyed and with a head full of the previous night, we stumble out onto this beautiful pre-sunrise postcard. Fishermen slowly make their way down the shore spreading their nets into the shallows. Most often their nets come back empty but seemingly unphased, they carry on away up the beach. Early morning conversations are often filled with serious topics like over-fishing and climate change, but hot black coffee and Kai Jeow (Thai Omlette) always kick-start another active morning at JamBay. Saturday mornings are usually spent kicking back behind the bar at Jam Bay watching the band twist, strum and tap their way to the right sound for the night’s jam session. Some mornings we’ll take a slow ride around the town, taking in the little hidden scenes and moments that fill the town of Khanom. We’ll stop off for coffees at Khanom Espresso and then cruise through the streets which are just getting ready for the day. No one’s in a rush and plenty of the locals will take time out to watch us go by. The weather is almost always treating us right and while the bar holds respite from the sun, the still blue ocean means we’ll be out cooling off before long. The band’s jamming in the background provides the perfect sounds for another beautiful day in Khanom. Setting up for a beach braai (BBQ) on Haad Nadan, Khanom. Khanom is a sleepy little town on the mainland, South-west of Koh Samui. Despite its proximity to the big tourist driven islands, it remains largely untouched and unknown. At least once a month we’ll set out for its quiet beaches, normally setting up camp at JamBay. If the bustle of a beach bar isn’t your thing, you can also find an empty stretch of beach to set up camp. One weekend we decided to do just that, and break our usual beer and hammock routine at JamBay. Thursday night we got together to prepare chicken and pineapple kebabs, mielies (corn on the cob) and a mix of fresh salads. 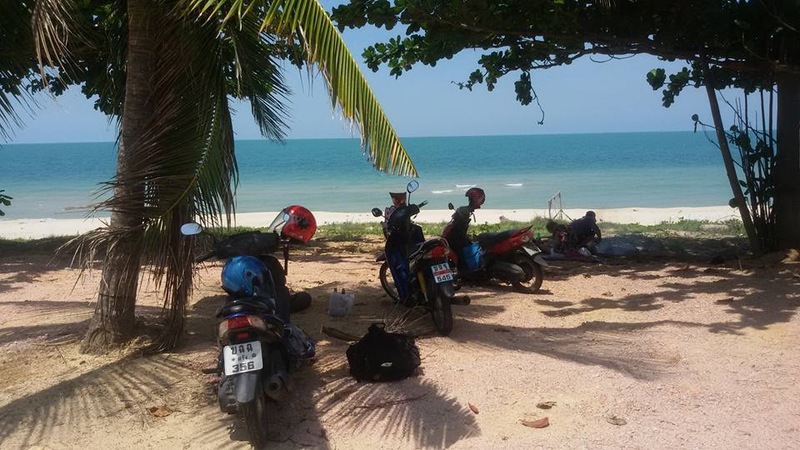 The following afternoon we piled our bikes high with tupperware, cutlery, beer and our well-worn grill, and set off up the coast for Khanom. We cruised along the quiet road which runs parallel to Haad Nadan and looked for a break in the bushes. One vacant property left a gate open with a path towards the ocean, so we turned off to see what we could find. Luck was on our side as the path ran all the way down to the beach and shaded us with palm trees as we parked up for the afternoon. We dug a hole in the sand with loose rocks than lined a rivulet which ran out the ocean. Filling the hole with kindling and the bag of coal we’d lugged around on the hour and half journey, we quickly had a fire roaring in the heat of the afternoon. We stacked the sides with more stones and carefully placed our grill on top of the blaze. Taking turns to keep an eye on the sizzling kebabs the rest of us cooled off with ocean swims or frosted beers in the shade. The afternoon passed slowly by, as we reaped the rewards of our efforts with plates piled high with food. With our bellies full and the afternoon dwindling, we packed the braai back on to our bikes and set off for Jam Bay. By the time we arrived, the local band had begun it’s set for the evening and offered the perfect way to bring another beach adventure to a close. Long-tail boats parked up against a building on a small river that runs through Khanom. Khanom as a town doesn’t see enough tourism to make it the main source of income for its locals. As such, when you’re driving around the town you’ll see more markets, local shops and vendors than you’ll see bars and flashy restaurants. These boats however, are in fact moored up under one of the few local bars. This little river flows under a small bridge and makes its way to the greater Khanom river which is full of big crab and fishing boats. Views from the town side are fantastic as the quickly rising green cliffs across the way contrast the wide river. Khanom is a fishing town and these rivers and the surrounding ocean are the life blood of the little village. Every morning you’ll find fishermen walking up and down the beach casting nets and at night and you’ll see the green glow of squid boats trying their luck further out towards the horizon. Khanom is a beautiful beach side town and the more we explore, the more we see how it’s location is more to the people than just a scenic backdrop to their lives. 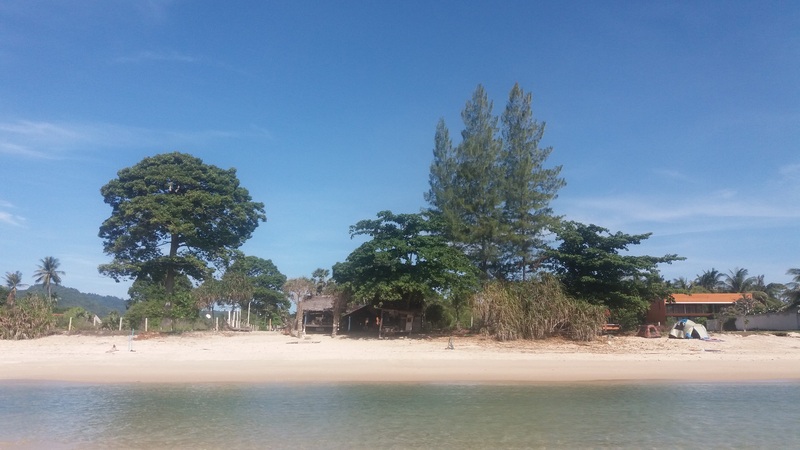 This entry was posted in Nakhon si Thammarat, Thailand, travel and tagged beach bar khanom, Jam Bay, Jam Bay Khanom, jambay, khanom, khanom beach, khanom bungalows, Nakhon si Thammarat. Bookmark the permalink. Just was at Jam Bay for the first time this past weekend – perfect description. Awesome 🙂 Thanks for the feedback and happy to hear you got to experience the Khanom we know! Oh really? Fantastic, so do we. No doubt see you around Khanom soon! Oh, cool! Yes, we must! Great blog by the way.